Road Scholar, here we come! 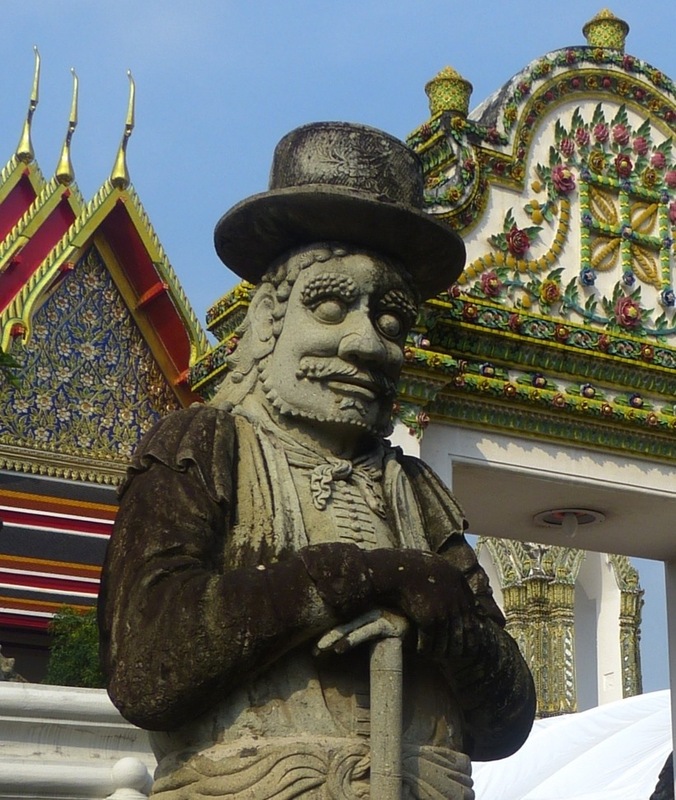 I’m so glad we arrived in Bangkok a few days before the Road Scholar tour started. Doing so gave us an opportunity to adjust to the time difference (although if truth be told, I STILL haven’t completely switched over to Asia time) and to slowly savor this magnificent city. Bangkok is amazingly affordable, so the extra days didn’t increase the cost of the trip by much. Four nights at the Bangkok Loft Hotel, for example, cost $175 TOTAL, and that included airport pick up, plus great breakfasts. The Loft was an excellent choice–within walking distance of the SkyTrain, just two stops from the river. It was quiet, clean, very comfortable, with all the amenities that are important to us: firm mattress, good water pressure, plenty of hot water, free wi-fi, perfect temperature control, excellent free breakfast, and helpful, friendly English speaking staff. Thank you, Trip Advisor! Before leaving home, I had gotten $250 worth of Bhat from our bank. Had we steered clear of the resort hotels (lunch at the Mandarin Oriental, drinks at the SkyBar, dinner at the Shangra-La), that amount would have been more than enough for our transportation, entrance fees to attractions and food during our stay. Rama IX’s portrait is on Thai money. He looks pretty good for an 86 year old man. But why does one denomination have a different portrait? The hotel chosen by Road Scholar, the Majestic Grande was also quite lovely, in the business section of town. Thursday night, we met our fellow travelers. The group is composed of 5 Canadians, 8 from Washington state, 2 from California, 2 from NY, 3 from PA, and the two of us from NJ. As with other Road Scholar Trips we’ve taken, the women outnumber the men, 14 to 8. I love making new female friends! In fact, one of the reasons we keep choosing Road Scholar is it seems to attract interesting, friendly, curious travelers who are fun to be with. Mike and I are looking forward to getting to know everyone better over the next few days. Friday was an action packed day, with visits to Wat Po and the Grand Palace, followed by lunch at the Supatra River House. After a lecture on Buddhism by Jim Lehman, we returned to the hotel. By then, all we wanted was some cold water and some cold air on our sweaty bodies! Here are some visual highlights from Wat Po. The Reclining Buddha is enormous–150 feet long by 50 feet high. It’s hard to get all of him into one shot. This gives you an idea of the size of both the Buddha and the crowd at Wat Po. The place was mobbed! Do you think these qualify as “Happy Feet”? The bottom of the Buddha’s feet are covered with mother of pearl. Talk about having big shoes to fill! The Wat Po grounds are filled with gold Buddhas, temple guards, and interesting statues. 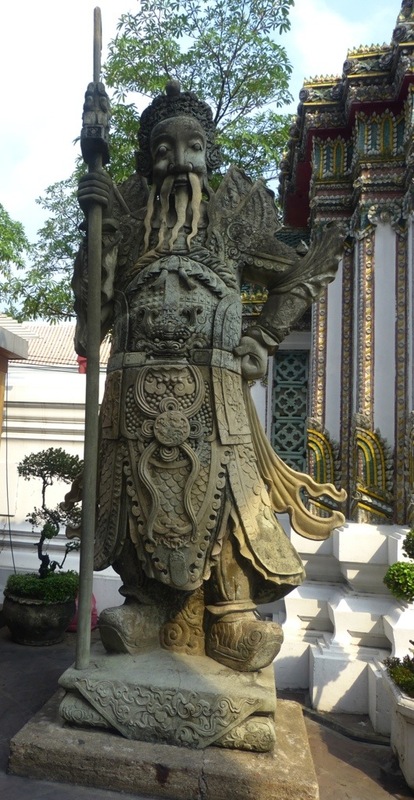 This temple guard is clearly Chinese. But what about him? To me, he looks like a cross between Charlie Chaplin and John Wayne. Our return to the Grand Palace was a different experience. We traveled by bus, which gave us a chance to get a different glimpse of the city. Road Scholar provides ear pieces, so that we can easily hear the guide. What a godsend in these crowded sites! Mike and I were glad that we had been able to spend time on our own, and leisurely wander the grounds; having a second go-round with a guide allowed us to see things a little more deeply, and catch some of what was missed the first time. 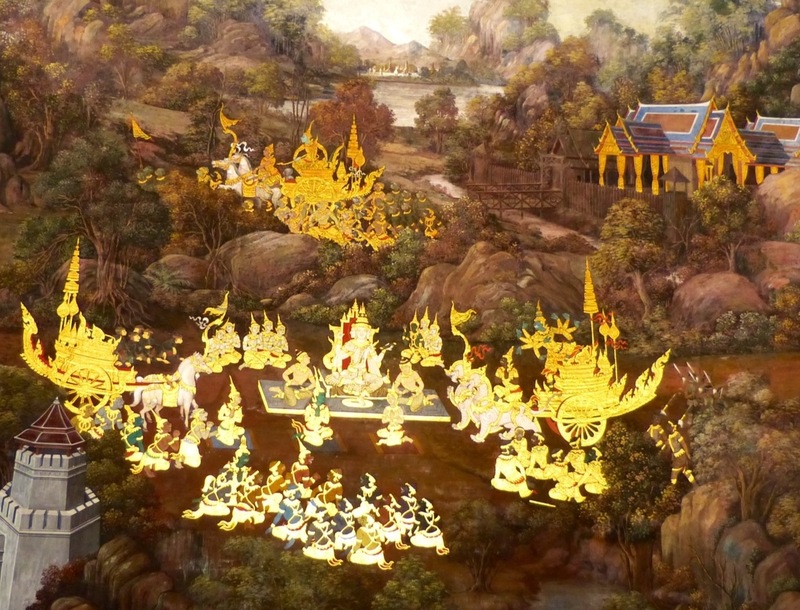 For example, the gallery surrounding the religious section of the Grand Palace is painted with scenes from the Ramayama, and the yellow “paint” in the scenes is liquid gold. My blog is lagging behind our activities, but I need to end this so I can get myself together for the start of our day. More to come! Glad you are all doing okay. I’m guessing power is back for everyone. Not sure what is going on with Lis…I miss her comments!